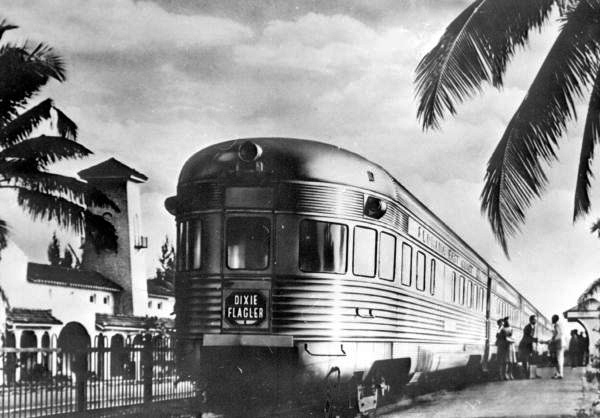 The Florida East Coast's Dixie Flagler was one of three principle trains (the other two being the Pennsylvania's South Wind and Illinois Central's City of Miami) that connected the Midwest and Chicago with the southeast and Florida. In terms of mileage the train operated the shortest schedule although its timetable was just the same as its two counterparts. Additionally, it required the partnership of four different railroads (six, including subsidiaries) to complete the journey. Despite the three trains being owned and operated by different railroads, all worked together to provide reliable service and were not really competitors in the truest sense. 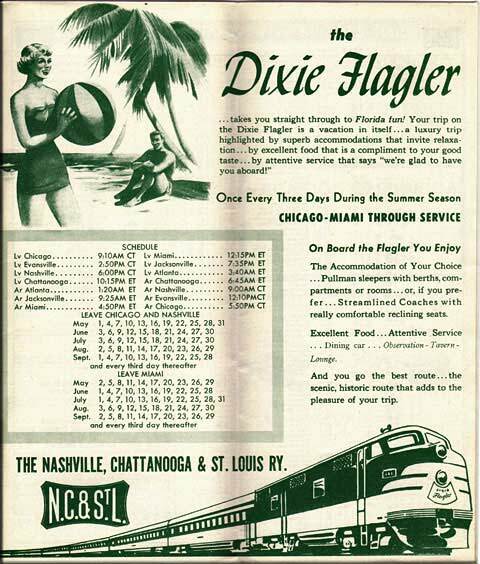 The Flagler saw its name changed in the early 1950s to the Dixieland and would not survive to the see the 1960s (which is somewhat interesting considering that the other two trains saw relatively healthy traffic through the start-up of Amtrak in 1971). 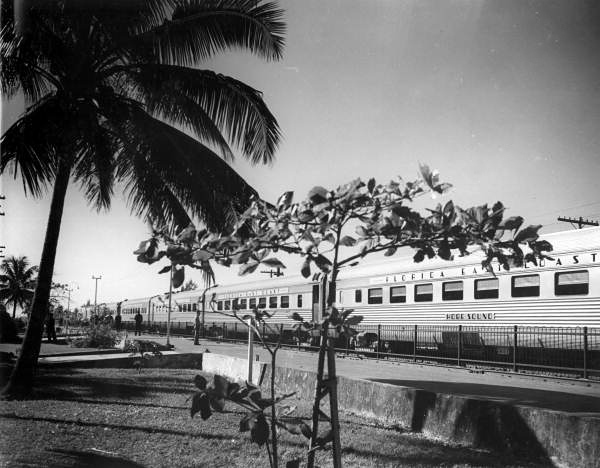 Because of the Florida East Coast's location serving Florida's largest Atlantic coastline cities like Miami, Jacksonville, Daytona, and others the railroad served as run-through service for numerous well known southern streamliners like the City of Miami, South Wind, Champion, and others. However, the company was never known for any long distance streamliners mostly because of its small size. The history of the Flagler dated back to 1939 (officially making it the first of the three trains to begin service) when the FEC inaugurated a regional train known as the Henry M. Flagler running across its entire system between Jacksonville and Miami. Despite its regional status the train was indeed a streamliner with equipment being provided by the Budd Company. For power this first train utilized two streamlined E3A diesel locomotives from the Electro-Motive Division (#1001-#1002) and overall was a seven-car affair featuring a baggage-coach-dormitory-coach, four standard coaches (with individual reclining seats), a diner, and a tavern-observation. Keeping with the theme of the region the FEC had the equipment named for different areas around the state of Florida. The train was quite elegant with the stainless steel cars led by the E3As painted in a mango orange and yellow livery with gold trim that was perfectly suited for where it operated. However, the Henry M. Flagler only survived for about a year when the FEC decided to work with the Pennsy, Illinois Central, and several other lines (nine in total) to provide Midwestern travelers three different high speed trains to the warm climate of Florida. This new train was known as the Dixie Flagler and was inaugurated on December 17, 1940 having been christened with a bottle of orange juice at Chicago's Dearborn Station. To complete the journey required the cooperation of five other railroads; from Chicago to Evansville, Indiana the train was handled by the Chicago & Eastern Illinois (which for power utilized a beautifully streamlined 4-6-2 Pacific); the Louisville & Nashville to Nashville; L&N subsidiary Nashville, Chattanooga & St. Louis carried it southward to Atlanta where it was picked up by Atlantic Coast Line subsidiary Atlanta, Birmingham & Coast which transported the train to Waycross (Georgia); from there the ACL handled the Flagler to Jacksonville where it returned to home rails of the FEC and finished the journey to Miami. 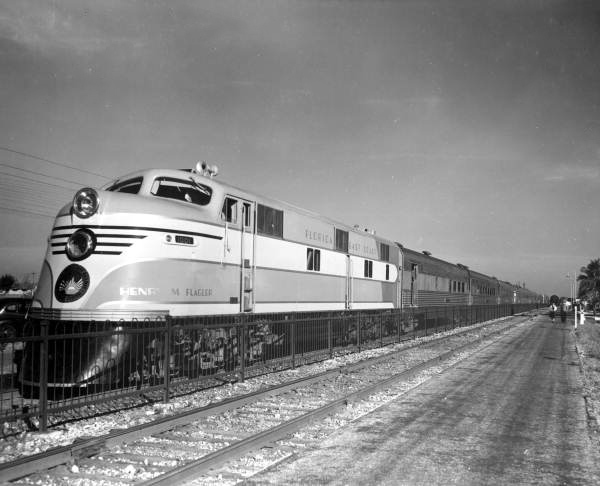 The 1940 version of the Flagler also saw the FEC purchase new EMC locomotives, the E6A (#1003-#1005) giving it a total of five units to provide power for all of the streamliners operating over its rails. Over the next 14 years the train changed little in terms of the equipment it used although the FEC did buy more new cab units from EMD after World War II, 17 new E7As between 1945 and 1947, #1006-#1022. In 1954 the Flagler finally received new lightweight equipment that included coaches and for the first time, sleepers. It also saw its name changed to the Dixieland. For whatever reason, although it has been speculated that the recession of the time is partly to blame, the train was not very successful during the 1950s. The train was also not helped by a deadly crash in 1957 that killed several passengers. Perhaps this was also an effect of the train's discontinuance but whatever the reason(s), the FEC elected to cancel the Dixieland before the dawning of 1958. 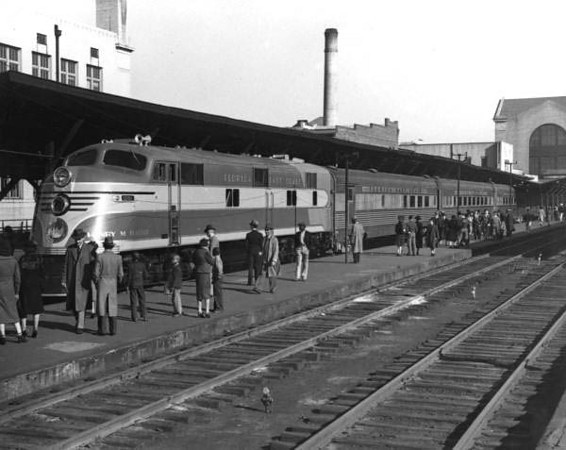 The train was an early casualty of the industry, particularly for southern streamliners most of which like its two counterparts saw high ridership all of the way until the startup of Amtrak.